During the 1940s McShann was at the forefront of blues and hard bop jazz musicians mainly from Kansas City. In 1979 he appeared prominently in the documentary on Kansas City jazz The Last of the Blue Devils. 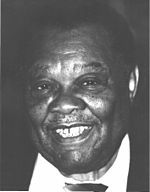 Jay McShann (January 12 1916 – December 7 2006) was a jump blues mainstream jazz and swing bandleader pianist and singer.